Coventry Talking Newspaper would like to thank the following companies for their support, donations and free services in making the music themes, jingles and voice overs possible for our show. Following a purchase of licenses to use the non-custom music from premium beats for new theme music, we set to create the music introduction jingles. The jingles used in the demonstration above use the jumper soundtrack from premium beats, existing voice overs (provided by Clare Anderson and voiceovers Ltd) were used and the track completed with the singing vocal talents of Josiah Ruff . To save costs, all the editing and production was completed by the in-house production and studio team at Coventry Talking Newspaper meaning all the work was completed under the £150 ($230) budget. 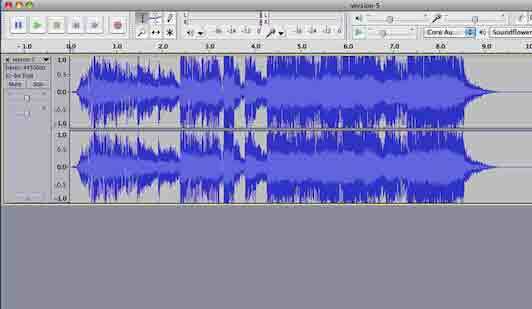 The backing tracks and vocals were imported into audacity, edited and enhanced using nectar enhancement software. Our youtube clip shows the process involved. One advantage to obtaining all the vocal only cuts is the fact the vocals can be added to any background. Some radio stations create “power intros” by adding vocal elements to the start of songs. It’s very easy to do and can sound effective. Although we would never need power intros, I played around with some as an example. Do we like these jingles? They turned out to better than we ever expected and better than anything else we have heard. By using a specialised music company to focus on the music, a vocal talent company to provide the best singing voices and our own production skills to taylor to our exact needs, we managed to bring the absolute best of everything together. The outcome blew us away. Secondly the combination is unique. The ability to link different musical works to any vocal singer around the world using the internet and correct production software means a very open market to create something specific. Jingles are an audio way to identify a station, brand or program through music and voice or vocals. The radio times wrote an article analysing the radio jingles used on radio 1 throughout the years. Radio has traditionally opted for sung jingles to build an image in the listeners mind, whereas TV concentrates more on visual effects to create an image. Sung vocals are more expensive than spoken voice and many brands opt for a spoken voice when budgets are tight. The bbc academy offered a workshop on creating radio jingles in 2013. How to make your own radio jingles? Whilst you can go to 3rd a party company to create TV or radio jingles, its really easy nowadays to locate the best music, vocalist and voice over online and craft together with the some of the worlds best software. Creating your own jingles enables people to retain control of the production. Then mix the best of everything for a complete tailored fit. Better still, if you know of a good vocalist and use can source some free background music then free jingles are a possibility if you have a PC and some of the free audio editing software available. There are four points to making your own jingles: Locate music, find vocals, add a voice over and mix together. Here is a list of companies that can assist with the four points in Jingle production. Cost per track. Several license options available. Find the voice that with create the best image for your brand. User software to mix music and vocals to create your radio jingles. Which software is based upon what your are familiar with and can afford. Melodyne – including pitch correct, vocal length and adding harmonies. Youtube has 1000s of self help guides including guides to making your own radio jingles. Alternatively, use on the following companies who will complete the jingle making process for clients. The advantage to this, is that an experienced production company can control the audio vocals overall sound. Many of them use online vocalists from the contacts listed above. They then piece together with pro audio software (or something similar) with their own music composition. Using their own musical compositions means they won’t be available to other outlets. Some will even make arrangements for the music to be exclusive for a period of time. Murfin music – Produced hundred of Jingles in the 90’s – Website now closed. Sue Manning – Jingles in Early 80’s then closed down. With some of these professional jingle companies using the same or similar session singers, obtaining a unique sound (if that’s what is needed) can prove to be a hard task. Music4 and bespoke music use Session singer online. Brandy, Reelworld, Ignite, S2Blue use Virtual vocals. Therefore wanting to create something unique and different could mean searching on-line for your own personal session singer. When purchasing a package of jingles from these production companies, more recently they use the same theme and musical composition and play around with the production, tempo and voice to create a variation or transitional version of the original sound. That’s perfectly fine if you want each jingle to be similar, especially if you want the same tune pushed into a listeners mind every 10 minutes. If a more uniqueness sound for each jingle is a requirement, it could be better to create each jingle using different composers, production companies and singers. The advise and links above can assist with this. There are numerous groups on the internet and around the world of companies who collect jingles and talk on forums about the latest musical compositions for branding including jinglemad.com and jinglenews.com.